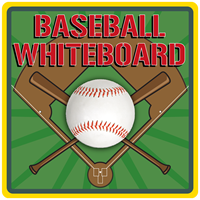 How are you using Baseball WhiteBoard? What new features would you like to see? We are looking to begin work on the next incremental update to all of the sports white board applications and would like your feedback. Please use the "Contact Us" screen to let us know what you would like to see. We are hoping to add animation and puck "attachment" in the next release, but what else would you like? Baseball Whiteboard Version 2.0 is now live in the App Store! The new version is a complete re-write of the original with support for the iPad as well as the iPhone/iPod touch. There is also a new manual available. Check the links on the left side bar for updated links! Baseball Whiteboard is still waiting to be updated to a Universal binary for iPad and iPhone. Many apologies to those waiting patiently for an update! I have not been able to apply the same methods I've used in the other apps because the Baseball version will need a much more specialized UI due to the nature of the baseball field really needing all of the iPad display (as opposed to the other apps where the rectangular nature of their fields/surfaces lends themselves to an iPad UI where there is a bar of controls). I am planning to re-write the sports white board applications over the next month or two and will make better arrangements for the baseball field. Baseball Whiteboard, like the other sports white board applications, was derived from Hockey Whiteboard. Please see the history section of Hockey Whiteboard for more details!